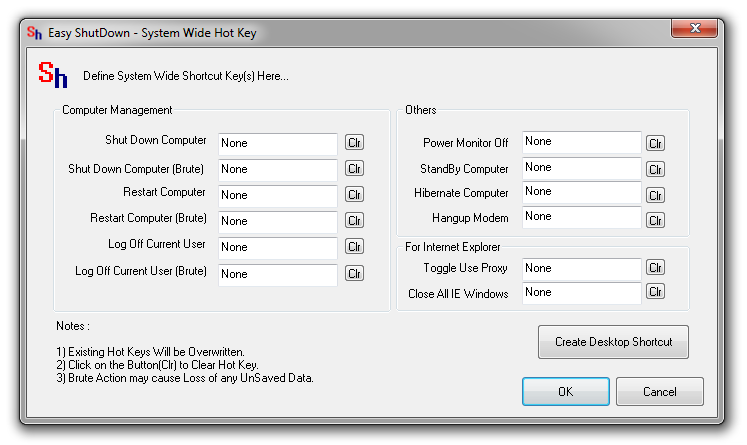 Launch System Wide Hot Keys Dialog Box from the Easy Shutdown Windows Utility Menu by selecting File - > System Wide Hot Keys. Now Press the Desired Hot Key in the Edit Box next to label Shutdown Computer. That's it. The Shutdown Hot Key has been created. Now when you press the hot key, a confirmation diloag box will appear and after 15 seconds, shutdown computer will be initiated. Now Press the Desired Hot Key in the Edit Box next to label Restart Computer. That's it. The Hot Key to Restart Computer has been created. Now when you press the hot key, a confirmation diloag box will appear and after 15 seconds, restart computer will be initiated. Now Press the Desired Hot Key in the Edit Box next to label Hibernate Computer. That's it. The Hot Key to send computer into hibernation has been created. Now when you press the hot key, a confirmation diloag box will appear and after 15 seconds, computer will be sent into hibernation (if supported).